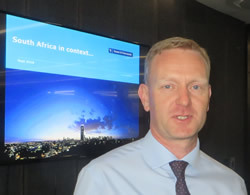 Neil Bullen, Global Head of Real Estate at Turner & Townsend flew in from the UK to give a presentation at a round table discussion held at the Mesh Club in Rosebank, Johannesburg. The high-level roundtable discussion brought together various stakeholders, with a representation from both the public and private sector. Pertinent in our time, is the ability of to adapt to change and remain relevant in the ever changing world. It was timely and perhaps necessary to bring together all relevant stakeholders to discuss the future of real estate and best practice trends in project management. In his presentation, Neil predicts that we will see major and disruptive changes in the real estate delivery model within the next 3 to 5 years. Worldwide the real estate landscape is changing. On a macro level several factors are driving this change and there is a great expectation of what technology can do. Just think about the tectonic shift that Airbnb brought about in the hospitality industry in just a decade. The new start-up company WeWork is also changing the way that people think about office space. WeWork was founded in 2010, it is headquartered in New York City and provides shared workspaces for technology start-up subculture communities, and services for entrepreneurs, freelancers, small businesses and large enterprises. As of July 2017, WeWork had a valuation of roughly US$20 billion and managed 930,000 m2 of office space. It is more of a club than a letting company as it designs and builds physical and virtual shared spaces and office services for its members (clients). The company has over a hundred thousand members who have access to health insurance, an internal social network, social events and workshops, and even an annual summer retreat. “The role of real estate and its clients is changing and we will see a new benchmark for best in class. New capabilities will be required to meet the changing landscape and we will see a new and deeper level of partnering relationships with key suppliers resulting in a win-win for all.” Neil said. He predicts that in the real estate industry, which has been resistant to change, we will soon see rapid acceleration in the adoption of digital approaches. By 2050, an estimated 70% of the world’s 7 Billion people will live in towns and cities. As this shift gains momentum, opportunities arise for those who own, manage and invest in property to consciously shape these changes in a socially responsible and sustainable manner. The delivery model will be horizontally and vertically integrated with the focus shifting to the whole life of the asset, less contracts and new integrated solutions. What could the benefits of such change be? It is predicted that the change could result in a 33% reduction in cost, a 50% reduction in project time and a 50% reduction in carbon emissions. Ziyad Adroos, Turner & Townsend's Head of Real Estate in Africa continued the discussion. In Africa, the conversation has shifted from one of the deficits and gaps to one about opportunities, prospect and growth. Ziyad touched on the current situation in South Africa regarding land reform, what the forces for change are and then explained how corporate real estate could be part of the solution . Exploring some of the forces impacting on real estate he showed how Steinhoff's troubles could have far-reaching consequences for the manner in which corporate real estate is managed in the future. Steinhoff International Holdings Ltd. Has approximately 12 000 stores in over 30 countries occupying 9million m2 of retail space, 2.5 million m2 warehouse space and a further 4 million m2 property portfolio. He mentioned that although land tenure is currently in the spotlight, ageing infrastructure, supply chain management, bureaucracy and the drawn out development process are equally challenging for the development of the real estate sector. “Are the conditions for change in Africa in place?” he asked. In his view, Ziyad, advised that technology is already driving change. According to Statista.com, in Asia Pacific, e-retail sales accounted for 12.1 percent of retail sales in 2016 but only for 1.8 percent of retail sales in the Middle East and Africa. What effect will increased online shopping have on the already oversupplied retail space in South Africa? What will the effect of self-drive Uber cars be on retail parking lots? In his conclusion he asked, “Can Africa afford to miss out”?